Welcome to the Internet-based Report of Contributions! This online report will help make your quarterly pension reporting task both easy and efficient. The Internet-based Report of Contributions (IROC) is accessed through the Employer Pensions and Benefits Information Connection (EPIC). Whenever you are working on your report, any inactivity lasting 30 minutes or more will cause your session in the EPIC system to "time out." You must log back into your MyNewJersey portal account in order to continue from where you left off. All changes made in the IROC up to that point will have been automatically saved. Please remember that this is a secure Web site. This security measure is intended to protect the employee information you are submitting to the Division of Pensions and Benefits. For help with establishing EPIC access to the IROC, you may call the Division's Employer Education Unit at (609) 292-7524, Monday through Friday, 8:00 a.m. to 4:00 p.m.
For help with completing the IROC, you may call (609) 777-2115, Monday through Friday, 8:00 a.m. to 4:00 p.m.
1. 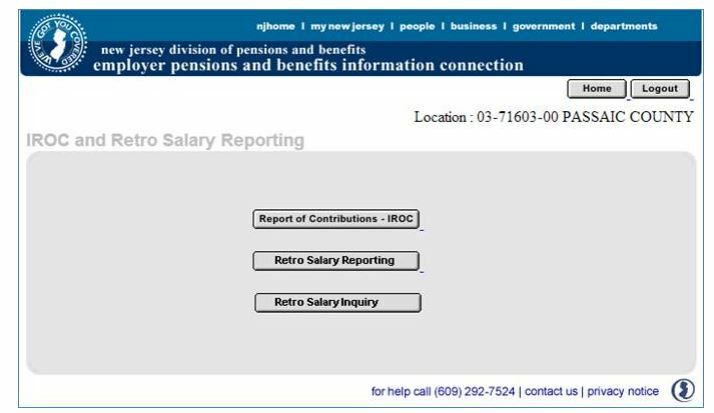 Select the location for which you want to do the Report of Contributions - in the example below, the employer chose the Police and Firemen's Retirement System (PFRS) location. 2. To complete the Report of Contributions for another location, you will need to return here and select the new employing location number before proceeding to the Report of Contributions application. 3. Click on the "Report of Contributions" button from the list of applications on the right. Once using the Internet-based Report of Contributions (IROC), all reports submitted from your location will be accessible anytime through EPIC. Past IROCs will always be available for review should you need them. If your location has multiple bureaus, all bureau numbers will be listed on this page. Select the location and bureau number for the Report of Contributions that you want to work on. If your location has multiple bureaus, for your convenience you may transfer a member from one bureau to another based upon your payroll reporting needs. This is discussed fully in this guide under the heading "Move a Member's Record to Another Bureau". NOTE: All bureaus must be completed before the Report of Contributions can be submitted. Once submitted, no further changes, including record modifications within bureaus, can be made. The IROC is formatted like a standard spreadsheet with rows and columns of information. Specific types of information appear in the columns and member account information is laid out in rows. Up to 15 members' records appear on a page at a time. The values cannot be altered when in this view. The sample that appears below shows how the IROC will appear on your screen. Enter the member's last name to go to the page that contains that record. Using partial names will also work (This method is most valuable when searching for a record that appears earlier in the report). NOTE: Using the "Back" button on your browser will also work to proceed to an earlier page. To access a member record that does not appear on the current screen, enter the person's last name in the field at the bottom of the screen, and then click "Go!" The record you are searching for will appear at the top of the new screen that appears. Please use this method to access records that appear earlier, as well as later, in the Report of Contributions. 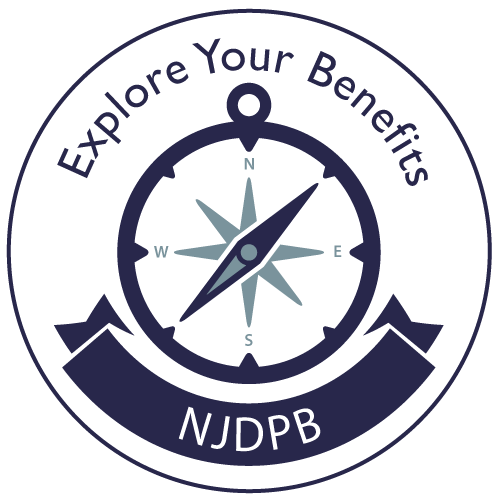 To edit or change a member's quarterly pension information, click on the member's name on the left. This link will bring you to a screen similar to the one that appears below. NOTE 1: If you need to modify a member's record and move the member from one reporting bureau to another, you must perform the bureau change first, then modify the member's record. See "Move a Member's Record to Another Bureau". NOTE 2: If you mistakenly change a member's record (e.g., enter an incorrect salary or deduction amount) and need to remove the change to restore the projected amounts, you must reopen the "Member Update" screen and manually enter the projected amounts that appear to the left of the text fields. If you do not, the incorrect amounts entered earlier will be retained by the IROC. NOTE 3: To change the amount "reported" in the text fields to "zero": using the "delete key" will not remove the reported amounts. Only typing a "0" (zero) for service and salary or "0.00 for deduction amounts will alter the record to reflect the correct information. NOTE 4: DO NOT use the "delete" key to remove information in the text field to denote "zero". Enter "0" instead. VERY IMPORTANT: If needed, make changes in salary, service, etc., only after making a bureau change. 1. Select a member's record. Notice that this member is included in the Bureau 1 report. 2. Click the "Bureau Transfer" button at the bottom of the page. Do not make any other changes in the record, i.e., salary, service, etc. 3. Using the drop-down box, select the bureau to which you want to move the member's record. In this example, Bureau 2 is selected. 4. Click the "Bureau Transfer" button. The member's record has been transferred to Bureau 2. 5. The member's record will be removed from the bureau you were working on, and will appear in the destination bureau when you open that part of the Report of Contributions. 6. A remark will appear in the "Remarks" column showing the change in bureaus. To update service, salary, etc. When a member's name changes (marriage, divorce, etc. ), you may enter the changed member name in the appropriate box. 1. When making a name change, it is not necessary to fill in every box provided for name change. You only need to enter the new information into the box for the portion of the name to be changed. 2. DO NOT: Please do not make a "name change" in order to add missing letters. The member's last name field in the Division's database is limited to 15 characters. Additional characters cannot be added, so this type of "change" only creates needless additional work. 1. DO: If the regular work year for a member changes from 10 months to 12 months, or 12 months to 10 months, please make this change here. 2. DO: Be sure to explain the change in the "Remarks" field. The expected number of months of service credit for the quarter is pre-printed for each member. 1. DO: If the member does not work the projected number of months, please be sure to change the figure in this column accordingly. 2. DO: Remember to report service in whole months only. No partial months can be reported or credited to a member's account. 3. DO: Enter "0" if the member did not work at all during the quarter. 4. DO: Make a notation in the "Remarks" field when changes are made in months of service. This information is most important for accurately crediting member accounts. DO: Report salary in whole dollars only. DO NOT: Do not put a period or decimal at the end of the whole dollar figure. The IROC will automatically calculate the regular pension contributions, Contributory Insurance Premiums (TPAF and PERS only), and Supplemental Annuity Collective Trust deductions (if any). 3. DO NOT: Do not make corrections or adjustments for errors made in prior quarters. Salary corrections for prior quarters must be made under separate cover to the Audit Section at the Division of Pensions and Benefits. 4. DO: (For Part-Time Hourly Employees) When reporting salary for part-time hourly employees under the PERS, enter the actual salary earned and select "part-time hourly" in the "Remarks" field. It is not necessary to select an effective date when making this change to a member's record. This amount is calculated automatically based on the amount entered in the "Base Salary" field. 1. DO: Please pay the exact amount calculated in this field. This figure represents the actual dollar amount due for scheduled Back Deductions for the quarter. 1. DO: Pay the exact amount printed here. This figure can be changed if necessary. 2. DO: If changing this value to "zero", you must type "0.00". 3. DO NOT: Do not use the delete key. Extra payments beyond those certified may be made if desired, but the amount paid and reported must be in even multiples of the certified monthly payment. Additional payments that are not precise multiples of the certified monthly payment will be rejected. Amounts you enter in this field must be in dollars and cents, hence: $45.34, or $60.00, etc. To change the projected amount, simply click in the "Back Deduction" field and type in the new figure. The information in this field is automatically calculated based on the information entered for Normal Pension Contributions and Back Deductions (see above). This amount represents the total quarterly tax-deferred (IRC 414(h)) pension liability for the member. This amount is automatically calculated based upon reported Base Salary and Back Deduction amounts and cannot be overridden or changed. This figure represents the actual dollar amount due for scheduled Loan Payments for the quarter. This figure represents the actual dollar amount due for scheduled Arrears or Purchase Payments for the quarter. The amount preprinted on the Report of Contributions is calculated by the Division of Pensions and Benefits based on the salary that the member was projected to earn during the quarter. The premium for Contributory Life Insurance is assessed for participating members of the PERS and TPAF as a percentage of base salary. For PERS members, the premium is .005 times the base salary. For TPAF members, the premium is .004 times the base salary. The amount is automatically calculated when changes in base salary are made. Back Contributory Insurance amounts owed (certified for new enrollees and transfers) are added to the figure automatically. DO: Always pay the precise amount specified in this field. DO NOT: Do not, under any circumstance, make changes in this amount for a few pennies. The calculated amount is the exact amount due for this benefit. The number in this field represents the after-tax dollar amount the member has designated as a SACT-Regular contribution. This amount is automatically calculated from the amount entered in "Base Salary". The number in this column represents the dollar amount - before tax - the member has designated as a SACT-Tax-Sheltered contribution. This amount must be changed when base salary changes or there is a gap in service. This amount is not automatically calculated by the spreadsheet, but must be manually calculated and entered when a change is necessary. To save time next quarter, you can inform the Division of Pensions and Benefits of up-coming salary changes by completing this information. The Division will use this projection to produce the next Report of Contributions. This information can be particularly helpful when significant numbers of employees will receive contractually established increases. For school boards this might happen at the beginning of the third quarter (July 1), or for municipalities, this might happen at the beginning of the calendar year. DO: Enter the new quarterly salary amount in whole dollars only. DO NOT: Enter full year salary information. DO: All other projections of salary changes should show the anticipated salary for 3 months in the quarter. DO: If the employee works a 10-month year, salary changes made in anticipation of the 3rd quarter would be for one month only (September). DO NOT: Never project less than 3 months' salary for the coming quarter. If you anticipate a member will return from a leave of absence part way through the next quarter, do not project this person's salary at all, but write the member on the next Report of Contributions. DO NOT: If you enter a projected quarterly salary for an employee in this field, do not add a comment in the "Remarks" field if there are no other changes in member information. This is the only change you can make without including a remark. DO NOT: If the salary for the following quarter will be the same as reported in the current quarter, it is not necessary to complete the "Projected Salary" field. FOR 10-MONTH EMPLOYEES Reported in the 3rd Quarter: Since one month's salary is reported in the 3rd quarter, it is not necessary to project a full 3 months salary for the 4th quarter. Since it is expected that these employees will have 3 months of service in the 4th quarter, the full 3 months salary will automatically be projected. NOTE 1: Complete for add-ons or if any changes are made to a member's record. This field must be completed whenever there is a change to the member's record. When you click on this field, a drop-down box becomes available. Click the "down-arrow" and make a selection from the available "remarks" in the list. DO NOT: Do not add a remark for a change that will occur during a future quarter. This entire report is used to communicate member pension information for the months covered by this quarter only. Whenever member service or salary information changes, be sure to include the effective date of the change to enable the Division of Pensions and Benefits to accurately adjust the member's account information. This field must be completed for all changes, except for part-time hourly employees. You should include additional comments if necessary - for example, describing a retroactive salary payment entered in Base Salary. DO: In the case of a retroactive salary payment, be sure to include the effective date for the new salary, contract period(s) covered by the new salary, and the new base salary(ies) the payment represents. DO NOT: When only projected salary changes are reported with no other changes in member information, do not add a remark in this field. This is the only change you can make without a remark. When you have entered all necessary information about this member, click the "Submit" button. The data will be added to the report and you will return to the main member screen. 1. DO NOT: Do not add a member to the Report of Contributions if it is prior to the date deductions are certified. In other words, do not add a member to the report if the current quarter is prior to the date deductions are scheduled to begin. 2. Click the "Add Members" button, which will bring you to this screen. 3. Enter all information applicable, including previously certified deductions and SACT payments. 4. When you have entered all necessary information about this member, click the "Submit" button. The data will be added to the Report of contributions and you will return to the main member screen. 5.If you open this screen by mistake, click the "Return" button and you will return to the main member screen. 6. Notice that no space is set aside for the member's name. The Member ID number will be used to pull that information from the Division of Pensions and Benefits' records. When a member is successfully added to the report, all information, including the member's name will appear on your screen. This will be important if an employee ceased working at your location before or during the quarter (due to termination, resignation, suspension or leave of absence) and has not returned to payroll by the close of the quarter. To delete an employee from the Report of Contributions who has not worked at all during the current quarter, begin by clicking on the member's name. Place a "0" in the box reporting "Months of Service" and a "0" in the box reporting "Base Salary." Then under "Remarks" click on the drop-down box and scroll until you find the comment you need — for example, "Resigned/Terminated" — and click on that comment. The comment you have chosen will appear in the "Remarks" field. Click in the "Effective Date" field and enter the effective date of this action. Once completed, hit the "Submit" button and you will see the employee's information change in the report. If the member worked only the first or second month of the quarter but is not on payroll as of the end of the quarter, place a "1" or "2" in the "Months of Service" field, one or two months' salary in the "Base Salary" field, add the appropriate comment under "Remarks" and the effective date. The IROC allows you to work part way through the Report of Contributions and then log-off. Changes will be saved so that you can continue your work from where you left off. You may work on the IROC through as many sessions as you need to. When all changes have been made and the Report of Contributions has been checked for accuracy, you will submit the report by clicking on the "ROC Complete" button at the bottom of the main screen. REMEMBER: All bureaus must be completed before the Report of Contributions can be submitted. Once submitted, no further changes, including record modifications within bureaus, can be made. VERY IMPORTANT: Please make sure you complete the Report of Contributions before making your final payments through TEPS. Changes you make to the Report will change the amount owed. Do not run the risk of paying more than is owed. Complete the Report of Contributions first. The following screen will appear that shows a comparison between the amounts owed on the Report of Contributions to your Transmittal Electronic Payment System (TEPS) payments for the quarter so far. A balance owed will be clearly displayed in red. The Report of Contributions will not be accepted if there is an outstanding balance owed. If your TEPS payments made for the quarter are for less than what is owed (as in the example below), then you will not be allowed to submit the Report of Contributions until you make up the difference. You will need to quit your session of the IROC and submit the balance owed through TEPS. Wait 24 hours for TEPS money to be posted to your location's account before attempting to submit the Report of Contributions again. When the posted TEPS payments report matches the reported obligations, your Report of Contributions can be submitted successfully. The goal, of course, is to transmit the exact amount reported as being due for the quarter. When the Report of Contributions amounts due balance with your TEPS payments, you may submit the report successfully by clicking, "Yes, please process the Report of Contributions." Overpayments will not prevent you from submitting the Report of Contributions. If the reconciliation page shows that you have already paid more through TEPS than the reported "balance due", you have the opportunity at this point to return to the Report of Contributions to make any corrections you may have missed. To return to the Report, click "No, please return me to the Report of Contributions." If the calculated amount owed is still less than the amount you have submitted by TEPS, the surplus money will be refunded after the quarter is posted. Once done, you will see a confirmation similar to the one that appears below. You are finished with this Report of Contributions! Once you have submitted the Report of Contributions, you may view it at any time through EPIC (once the quarter is updated) but you will not be able to make any further modifications. If you discover that there is a mistake in your submitted report, you will need to send your corrections in writing to the Audit/Billing Section, Division of Pensions and Benefits, PO Box 295, Trenton, NJ 08625-0295. All quarterly Reports of Contributions are due on the 10th of the month following the close of the quarter. The first quarter (January to March) IROC is due April 7. The second quarter (April to June) IROC is due July 7. The third quarter (July to September) IROC is due October 7. The fourth quarter (October to December) IROC is due January 7. There are penalties levied if reports and transmitted money are submitted late. From the Administrative Code: 17:1-1.5 "Interest charges: delinquent transmittals:"(a) If payment in full, representing the monthly transmittal and report of contributions or charges is not made within 15 days of the due dates for such transmittals and reports, interest at the rate of six percent per annum shall commence to run against the total transmittal of contributions or charges for the period on the first day after such 15th day. (b) The penalty will apply where the moneys have been forwarded but without the report necessary to distribute such moneys to the proper accounts. In addition, you can print a copy of the ROC at any time that you find it helpful during the completion process. Just be sure to save a copy of the IROC after it is accepted by the Division. The Report of Contributions will also be available indefinitely through EPIC should you need to refer to it in the future. If your computer system is not compatible with Adobe Acrobat™, please see your System Administrator or contact Adobe, Inc.